x twelve months ago I have become passionate about the social and mental aspects of a dogs life. Since adopting Tate I have taken him everywhere with me. When your pet is in my care they are treated as my own. Walking I try and mix it up to give the dogs a variety. In day care the dogs can play together, with balls or toys, dig in the large sand pit or splash in the wade pool. They can snooze on the dog beds or cuddle up on the old lounge chairs. It is not a large outdoor area as it gives to being able to interact with the dogs and give the human presence that some desire. I don't believe in leaving dogs on cement in pens. I have an outside grassed area and beds on wooden floors in air conditioning inside for those hot days. 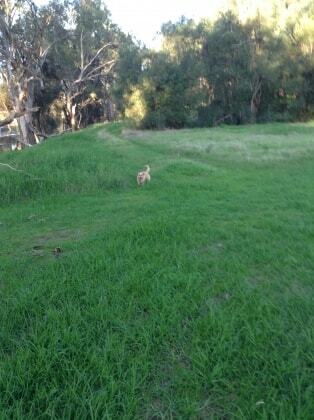 Well trained dogs are taken to the beach, Whiteman Park,dog park or to a fenced off park where they can run free. Grooming can be arranged, must book. Yvonne and her cute little dog make my guys so happy.even helps Preston get through his anxiety issues. They have the best time together and Yvonne sends great updates and photos. Also she goes out of her way to make my pups happy. I was so impressed with Yvonne and the whole experience, I immediately knew Bella would be in good hands. Yvonne communicated with me regularly with pictures and updates which made me feel comforted. I highly recommend using Yvonne and will definitely use her services again. A certificate 1V in companion animal services.